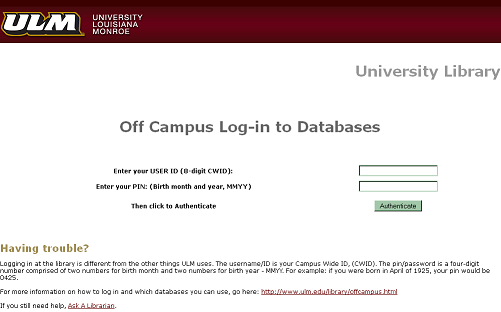 If you need help searching the databases or anything else, you can give us a call at the Reference desk at (318) 342-1071, email us at reference@ulm.edu, or use our online Ask A Librarian form to send us a message. Are you attempting access directly from the ULM website? Bookmarking a page in a database doesn't work the same way as most "internet" resources. In most of our databases, the link is just temporary and will not work the next time you access the same link. To ensure that this doesn't happen, try using a "permalink," "PURL," or just copy and paste the citation information. What browser are you using? Every browser handles information differently. The most-used browsers often work well (i.e. Internet Explorer, Firefox, Safari). It is also important to use the latest version of your browser of choice. Do you have cookies turned on/off? Cookies should be turned on. What does the error page look like? If you can't describe your problem, try to copy the text of the page or press "print screen" on your keyboard (Windows users) and paste the image into an email to send to us. Does your computer have security settings or firewall programs? Your computer might refuse to allow a connection. Check your browser and firewall settings.